Round six takes us to one third of the home and away season being completed; but the form is still unpredictable and the ladder order looks far from settled. A weekend of upsets and form reversals poses more questions than it answers. St George celebrated Past Players Day at Olds Park on Saturday afternoon. Dragon legends from bygone eras returned to the scene of past triumphs, the anecdotes getting wittier as the day progressed. All while watching the present-day Dragons taking on Wests; and they would have been impressed with what they saw. Keen to bounce back after two straight losses, the Dragons hit the ground running with an explosive opening term that ensured they would remain in front all day. The scoreboard told the tale with five goals to two, a quarter in which the Dragons controlled proceedings around the ground to set the result up as they went to an 18-point lead at the first change. The Magpies, after their breakthrough win last week, weren’t going to give up without a fight; and they put every effort into regaining the lost ground in the second term. Throwing caution to the wind and focussing on all-out attack, the game moved at breakneck speed through an entertaining second term. The Magpies would achieve four goals for the quarter, trying hard to get back into the contest. But the Dragons would come up with the answering goals when they were needed, and would get four goals themselves for the quarter. For all the Magpies’ efforts, the Dragons increased their lead in the quarter, leading by 21 points at half time. Already with a handy lead, the Dragons tightened the screws in the third quarter and the Magpies didn’t have the firepower to match them. It was five goals to three for the quarter, but that was enough to extinguish any Magpie comeback hopes and ensure the rapidly-swelling crowd around the clubhouse would have plenty to celebrate. With a 35-point lead at the last change, and massive numbers coming onto the field around the Dragon huddle at the break; this was the Dragons’ day. Percentage could be all-important in the wash-up this season, and the Dragons had to keep going in the last quarter to give theirs a boost. Five goals to two was enough to do that, setting up a 53-point win and consolidating the Dragons’ place in the top five. Nathan Kenny was the star of the show, an effective target up forward with an imposing seven-goal haul for St George; while Jack Hill contributed four goals to the Dragon cause. Dominic Michalak, Karl Merson and Nathan Kenny were the Dragons’ best. The win broke a two-game losing run for the Dragons, putting them on three wins and two losses and keeping them among the higher-ranked teams on the ladder. It wasn’t a great day for Wests, but they kept working hard all day even with the odds stacked against them. Nick Salter was again impressive up forward with six goals; while Dan O’Connell, Brenton Mumme and Pat Wilmot worked tirelessly all day. With one win from five games, the Magpies have plenty of work to do to get into finals contention. This was their biggest loss of the season; but even in this game they showed they have something to work with. Pennant Hills are beginning to make their move up the ladder, and made a statement to the rest of the league that the Demons are still a genuine threat when they recorded a dominant 51-point win over UTS at Waverley Oval on Saturday afternoon. From the start, it was clear that the Demons were a side that had come to play and they wasted little time in making an impression around the ground as time and again the ball would be pumped from the centre into the forward 50 in little time. The Demons weren’t always accurate, and missed some shots that they should have kicked; but the sheer volume of possession meant the next opportunity was never far away. Four goals to one saw the Demons ahead by 22 points at quarter time. The Demons were on top and the trend would continue in the second term. The Bats would manage three goals for the quarter, but they were rare moments of respite from a Demons side that had rediscovered their form and touch after a quiet start to the season. And the Demons would score another five goals during the second quarter, extending the margin to 35 points at the long break. It hadn’t been a great day for the Bats, and it didn’t get any better in the third quarter. The Demons had the momentum and continued to press hard in the third quarter; and it was another lopsided term of footy as the Demons continued the relentless drive of the first half. It was a quarter that would yield six goals to one for the Demons, the margin stretched to 68 points at three quarter time. The sting had gone out of the game in the last quarter, with the Demons having the game safely won and happy to put their cue in the rack. The Bats would win the last quarter by three goals to two, but that would only narrowly offset some of the massive margins of the first three quarters. Tim Wales, Ranga Ediriwickrama and Aaron Crisfield were the Demons’ best, but it was a solid team effort by a Demon outfit that were playing their best footy of the season to date. Three wins and two losses for the Demons, and a handy percentage boost this game, sees the Demons move into the top five and building some form as they move up the ladder. It wasn’t a great day for UTS. The Bats’ third loss on the trot sees them with just two wins from their first two goals and at serious risk of falling out of touch with the teams in the top five. Daniel Crouch, Peter Kilroy and Louis O’Keefe kept putting in solid efforts all day; but there’s plenty of work for the Bats to do to turn their current form slump around. 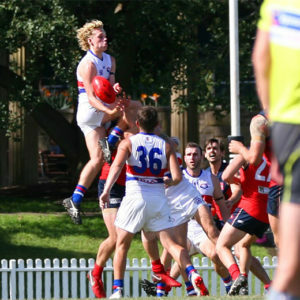 UNSW-ES have been the competition’s biggest improvers this year, and the Bulldogs confirmed that status in style on Saturday afternoon when they got up in a thriller against North Shore at Mortgage Choice Oval. It wasn’t a result that was looking likely in the first quarter. The Bombers, one of this year’s favourites, looked to have everything under control during the early exchanges. It was four goals to two in favour of the home side, with the trends in general play running their way as they led by nine points at quarter time. But when the teams emerged from their quarter time huddles, it was the Bulldogs who grabbed the initiative and soon found themselves getting a lot more of the footy and being more effective with how they used it. Suddenly there was a drive in the Bulldog side, and they were playing with a confidence and determination that enabled the momentum to swing their way. And the rewards for effort would be forthcoming, as a run of four goals to one turned the quarter time deficit into an eight-point half time lead. The Bombers had to lift in the third term, and around the ground they did. Time and again they would get the ball into the attacking zone; but some wasteful finishing would cost the Bombers dearly. The third quarter was three goals apiece, despite the Bombers having many more opportunities. But the inaccurate return of 3.8 meant the Bombers were unable to regain the lead; still finding themselves five points down at three quarter time. The last quarter was a thriller, the tension rising as two desperate teams threw everything they had into an enthralling contest. Just two goals apiece would be scored in the final term, as both sides’ defences were magnificent in rising to the occasion with a succession of saving marks, golden fists and physical pressures that prevented scoring heroics from taking place. The Bombers briefly took the lead, but the Bulldogs had the timely reply. Every play was critical as pack after desperate pack of players surrounded the ball and the pressure and heart rates rose with every minute that ticked by. But eventually time ran out, and the Bulldogs prevailed. On a day when goals were at a premium, Michael Thompson’s four major scores for the Bulldogs were worth their weight in gold. Max Lower, Darcy Cordell and Justin Cann featured prominently around the ground for the Bulldogs. UNSW-ES are a young and developing team, but they’ve already won four games this season; more than they did in all of last year. They sit comfortably inside the top five, and with the grit and determination they showed in this contest, there’s nothing to suggest they don’t have what it takes to stay there. Shaun Crane, Chris Murphy and Dylan Smith worked hard all day for the Bombers; and the North Shore side played some good footy in their share of what had been an absorbing contest. The loss, the Bombers’ first since the opening round, sees them on three wins and two losses; dropping behind the Bulldogs but still well inside the top five. East Coast and Manly battled it out at Kanebridge Oval on Saturday afternoon. Both teams have enjoyed premiership success in recent seasons, but going into this game were well off the pace for adding another trophy to their cabinet this year. 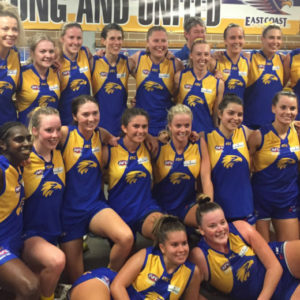 It would be the Eagles who would make a crucial step towards getting their premiership aspirations back on track as they scored a comprehensive 60-point win. The Eagles would kick four goals to two in the opening term. The home side looked the better team in most facets of the game; but the Wolves were hanging in there and not making it easy for the Eagles. But it was a strong Eagles team on the field, and they were looking good to lead by 15 points at quarter time. The floodgates opened in the second term as the Wolves’ resistance crumbled. This was East Coast Eagles getting back to their best form, touch which has eluded them for much of this season. The locals were revelling in the quality of footy their team was playing as they dominated proceedings at all parts of the ground; and the scoreboard soon began to reflect the one-sided nature of what was going on. Eight goals to one for the quarter opened up a 57-point half time lead. 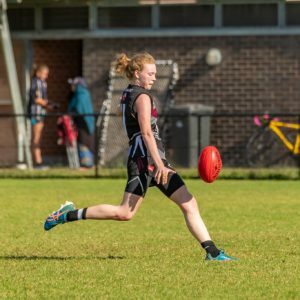 Manly attempted to stop the rot in the third quarter, and had some success as they won the term. Only by a point, after a quarter in which each team kicked four goals; but at least they were able to salvage something after what had been a disappointing first half. But the Eagles were still 56 points to the good at the last change; the defending champions still on track to count down to a comfortable victory. The Eagles won the last quarter by four goals to three, further boosting their percentage as they took the final margin out to 60 points. But it was in the second quarter where the real damage was done; a quarter where the Eagles were able to replicate the premiership form of last season, something they had struggled to do for much of this year. 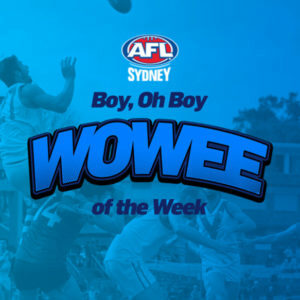 Goalkicking was like counting the days for Mark Weekes as he counted seven for the Eagles; while Jamie Vlatko also had a handy day up forward to kick five. Weekes and Vlatko, along with Stuart Turner were the Eagles’ best. The Eagles have three wins and three losses, this result helping their percentage considerably. Wills Brassil, Eric Burke and Lachlan Kilpatrick picked up plenty of the ball for Manly. But there was no escaping the fact that this was another heavy loss for the Wolves. One win so far this season and another heavy hit to their percentage sees them on the bottom of the ladder, and the Wolves will need to regroup quickly to get back into the finals race. It’s extraordinary how tight the ladder is from third to fifth; with Pennant Hills, St George and North Shore level on wins and losses and the three teams separated by 0.67%. Every game those teams play, and every score for and against could make a massive difference to how the final ladder shapes up. There’s no Premier Division matches next weekend, with an earlier Rep game than in previous seasons; with AFL Sydney taking on the Black Diamond AFL on the Central Coast next week. Premier Division will return on Saturday 27th May. But there will be matches in some other divisions next weekend. And with no Premier Division next week, this column will take a break for a week. The fixtures section below includes matches scheduled for the next two weeks.